Tony Romo has had a less than stellar dating history, including a romance with singer Jessica Simpson, who he notoriously dumped the night before her 29th birthday, according to People. But the former Dallas Cowboys quarterback scored a touchdown in the love department when he met beauty pageant queen Candice Crawford. Yes, Crawford, as in Gossip Girl actor Chace Crawford's younger sister. 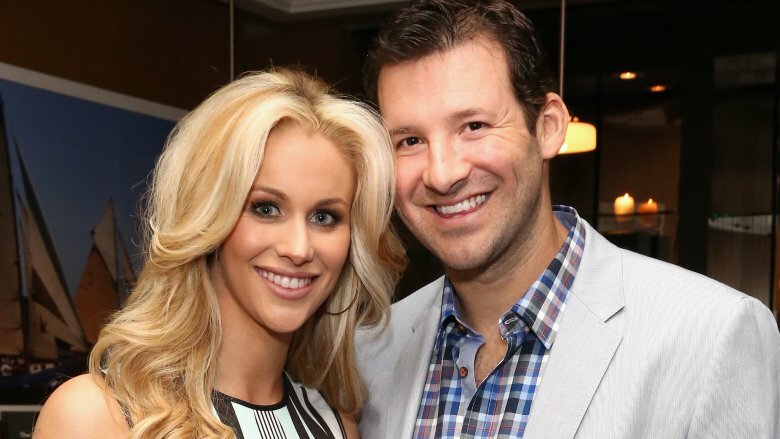 While Romo gave Simpson the old heave-ho as a pre-birthday gift, he did the complete opposite with Crawford on her 24th birthday on Dec. 16, 2010, surprising her with a 4-carat diamond engagement ring, Us Weekly reports. She said yes, obvi! The couple tied the knot in 2011, and as of this writing, they have three sons: Hawkins, Rivers, and Jones. Though Crawford's days of being the wife of an active football player came to a close when her husband retired from the league in 2017 after 14 seasons, she's staying as busy away from the field. If she's not "sword fighting" with her little ones, she's flexing her entrepreneurial prowess, acting as her hubby's "spiritual mentor," or showing off her impressive golf swing. 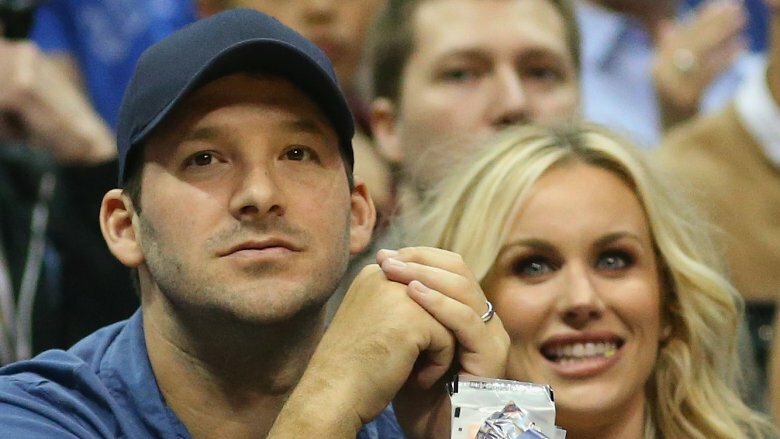 Here's the untold truth of Tony Romo's wife. Candice Crawford reportedly attended high school at Trinity Christian Academy in Addison, Texas, and then enrolled at the University of Missouri to study business and journalism. As a college student, she worked at the "local NBC affiliate KOMU-TV as a reporter," according to People. She eventually became involved in the sports world through "the Dallas CBS affiliate KTVT as a reporter covering the Cowboys on the station's show The Blitz." And that's where she would meet her future husband, but we'll get to that segment of her life in a bit. The Pi Beta Phi sorority sister certainly kept busy throughout her college years. Between going to class and her internships, she also reportedly found time to squeeze in some work as a volunteer writer for the sports blog, Midwest Sports Fans. Long before she became a WAG (the acronym for wife and girlfriend in the sport's world), Candice Crawford was reportedly a teenage beauty pageant contestant. According to Heavy, the Lubbock, Texas native competed for Miss Texas Teen USA in 2003 and 2005, but she apparently found more success outside the Lone Star State. As a college student at the University of Missouri, she snagged the title of Miss Missouri in 2008. All hail the queen! In her pageant interview footage, Crawford gushes while talking about her "passion" — sports. "I played sports my entire life — basketball, cross country, golf, and track. And, I refuse to not have sports in my life" she says in the clip. After snagging the Miss Missouri crown, Crawford advanced to the Miss USA pageant in 2008. She finished in the top ten, losing out to — you guessed it — a Texan named Crystle Stewart. When Candice Crawford interned for the Dallas Cowboys, she left with way more than some on-the-job experience. According to a 2010 KTCK interview transcript provided by Sports Radio Interviews (via Deadspin), Crawford said she was "doing [the Cowboys'] off-season show The Blitz" one summer, and that was where she came in contact with many of the team's players, including its quarterback, Tony Romo. Crawford mentioned she was "underage" when they met, but two years after that summer gig, the stars aligned for these two sports enthusiasts. Crawford said she had ended a relationship and Romo had broken up with his girlfriend, leaving them both free to get to know one another in a new way. "And I got back to Dallas to do Special Edition. The Cowboys broadcasting department who I am really close with were like, 'Hey [Romo], we hired your intern friend again,'" Crawford recalled. "We ended up going out and have been going to dinner ever since." To gather up all the juicy details about the start of Candice Crawford and Tony Romo's relationship, we need look no further than her older brother, actor Chace Crawford. He was more than willing to spill the beans about the early stages of his sister's romance during a 2016 interview with The Rich Eisen Show. Chace claimed Candice was caught "off guard" when she realized Romo would be picking her up from home for their first outing, which he described as a "movie/dinner date, where you're eating at the theatre." Candice still lived with her parents at the time, and they just so happened to be "massive Cowboys fans," Chace said. "[Candice] didn't want them in the house. And they said, 'We're already here. What do you want us to do?'" Candice had an easy solution. Instead of risking her parents blowing her first date with the football great, she told them to "hide in the back," Chace said. "So she pushes my parents back in the back. I thought that was really funny." Who knew Chace was a real-life Gossip Girl? Thanks for the tea, bro. 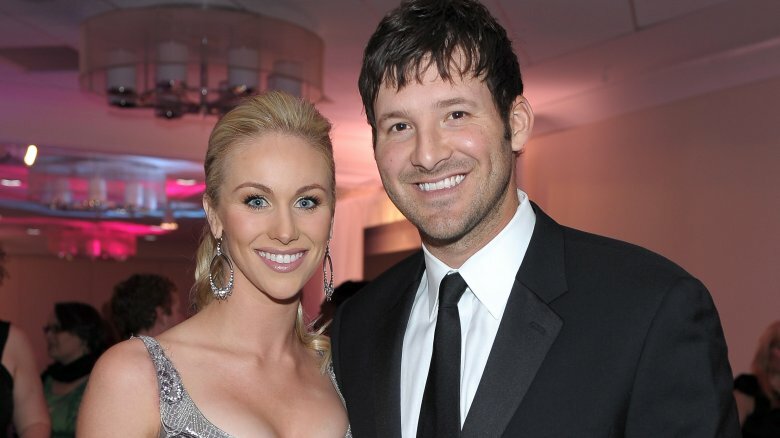 After nearly two years of dating, Candice Crawford and Tony Romo got married at Dallas' historic Arlington Hall, reported People. Their May 2011 nuptials took place in front of 600 guests, including quite a few current and retired football players, from Dallas Cowboys Hall of Famer Troy Aikman to Romo's good friend and then-teammate Dez Bryant. Even the Cowboys' team's owner, Jerry Jones, was in attendance. "It was perfect!" a source told People. "From the ceremony in beautiful white, to a vibrant after-party and great music selected by Tony himself." The dance floor was "packed" all night, so Romo's playlist was obviously a hit! To refuel after all of that booty shaking, the couple's wedding planner, Todd Fiscus, told WFAA-TV (via Us Weekly) that guests were treated to a Texas-size offering of food, which included short ribs and a pizza bar. As for the wedding cake, a source said it was "almost as tall as the ceiling." And just like that, we're starving. Tell us more about this pizza bar. Candice Crawford watched helplessly from the sidelines as her husband was plagued by multiple sports-related injuries, including a compression fracture in 2016 that caused him to miss nine games during the season, according to Sports Day. 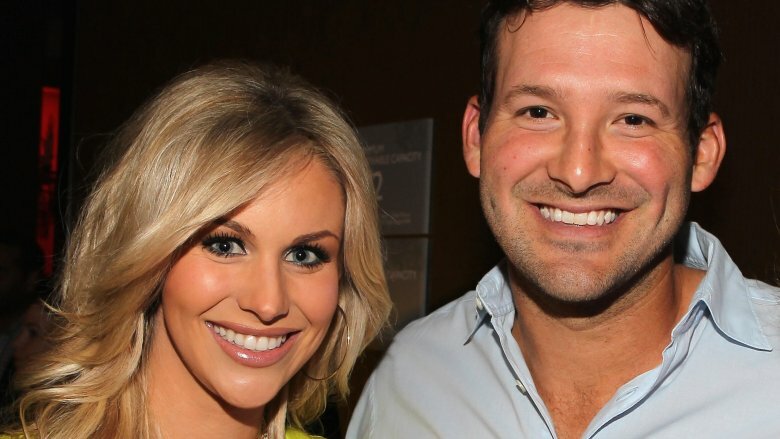 Looking back on Tony Romo's football career, Crawford told Cupid's Pulse: "Being in the NFL is kind of like being on a reality show every week. You're living and dying by these wins and losses, and then, of course, injuries come into play and you're stressed every game." Crawford said living with the constant worry that her husband would "get hurt during a game and how that injury would affect his life at home" was very stressful. When Romo finally hung up his football cleats, she admitted, "There was this underlying weight that I didn't even know was there that was totally lifted." Though she knew she would miss "being a part of the NFL family," something tells us she's perfectly content with Romo's subsequent gig as a CBS sports analyst. You know, where he can sit yards away from the action, tucked away in the broadcast booth all safe and sound. 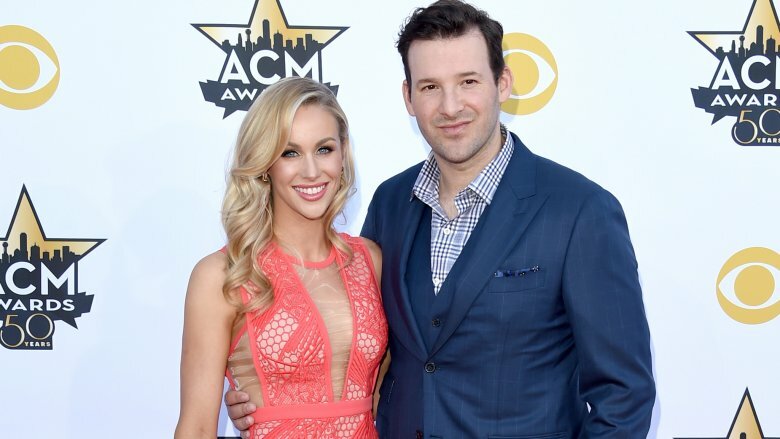 It was reportedly Tony Romo's faith in God that initially captured Candice Crawford's attention. "Something that was always most important to me was finding someone that had the same beliefs and faith as I did," she told Ok! magazine in 2011. "As soon as we had talked about that and shared those types of feelings of our faith, I think that was when it was a definite deal maker." Romo's Christian faith has made numerous headlines over the years. He's a huge supporter of the "Miracle of the Millions" faith-based charity, announcing a $1 million donation in 2012. According to Fox Sports, the organization was founded by Dr. Tony Evans, pastor of the Oak Cliff Bible Fellowship and the man who co-officiated Romo's wedding. In 2016, he talked about football injuries and God with a high school Bible study group of about 300 people. "I'm lucky to love something bigger than myself, obviously, in the Lord," Romo told NBC DFW in 2016. "That's an easy way for me to get through all the rough patches that go on in life." Crawford is clearly on the same page. "Without faith and the hope of something after this life, that it would be a lot harder to get through the [football] season." Less than a year after getting married, Candice Crawford and Tony Romo welcomed their first child, a boy named Hawkins Romo. Less than two years later, in March 2014, Crawford gave birth to their second son, Rivers Romo. A third bouncing baby boy named Jones Romo joined their team in 2017. In a tweet announcing Jones' birth, Tony said, in part, "Almost have my basketball team built." Perhaps this brood will continue to grow, but for now, Crawford has her hands full juggling motherhood and her own business. She launched Hawk + Sloane, a line of essential oil sprays, with her middle school friend and golf buddy Hollie Siglin. The company began when Crawford and Siglin "had the same due date for their first sons," according to its website. 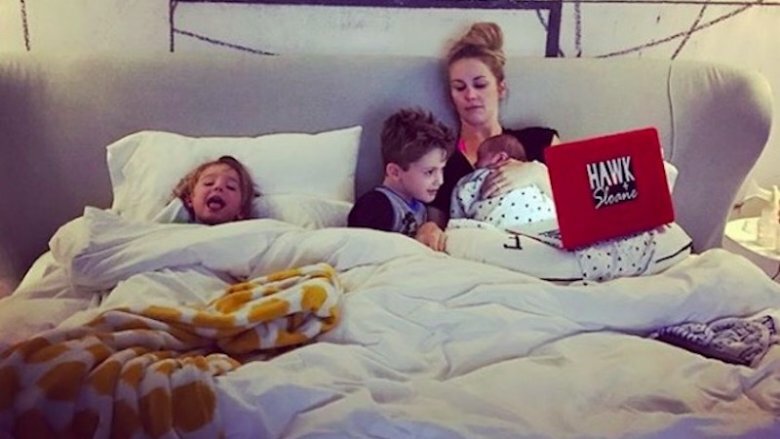 The entrepreneurs used the names of their unborn boys as the name of the business, and they're certainly taking aim at fellow moms and dads with little ones. One spray claims it can help discipline a "sassy" child; another is designed to lull a baby into lala land, and there's even a spray that attempts to mask the smell of stinky diapers. Pee-yew! With his football career in his rearview mirror, Tony Romo attempted to qualify for the U.S. Open golf tournament in April 2018. Alas, he came up short after he "chunked a flop shot into the front pond, leading to a double bogey," according to Golf.com. 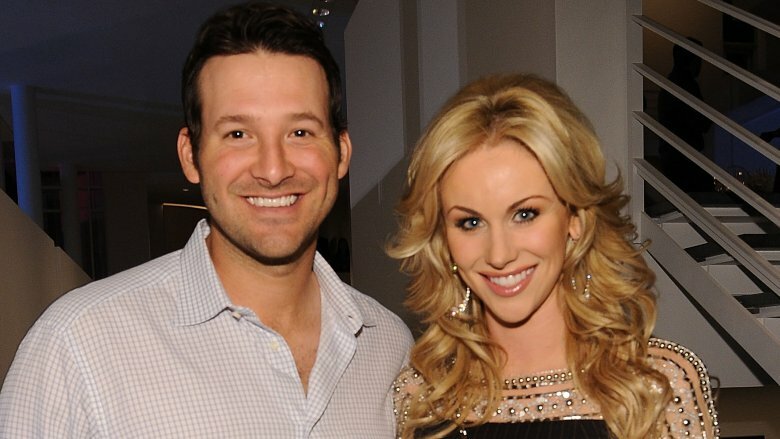 Come to find out, Romo's wife, Candice Crawford, might have a better chance at going pro. She's been golfing for years and showed golf enthusiasts what she was working with in 2015, when she appeared on a segment of Help Me Peter Kostis. The golf analyst was quite impressed with her kills, stating that she had a "wonderful-looking golf swing" but advising her to work on her "leg action." Even the couple's eldest son, Hawkins Romo, had his swing critiqued for the show. In fact, Kostis labeled the tiny tot (who was 3 years old at the time) the golf champ in the Romo family, with Crawford coming in second, and Romo finishing last. Whomp whomp. Aside from his aforementioned relationship with Jessica Simpson, which lasted from 2007 until July 2009, Tony Romo also had a brief romance with country singer Carrie Underwood in 2007. And guess who else was Underwood's boo for a moment in time back in 2008? Candice Crawford's brother, Chace Crawford. Awkward! According to People, Chace was the one who ended things with the "Before He Cheats" star "He was upset, but he also had to make the decision that it wasn't meant to be anymore," a source told the magazine. Insiders also claimed Underwood wasn't all that broken-hearted, alleging she was still close to Romo, despite his romance with Simpson. 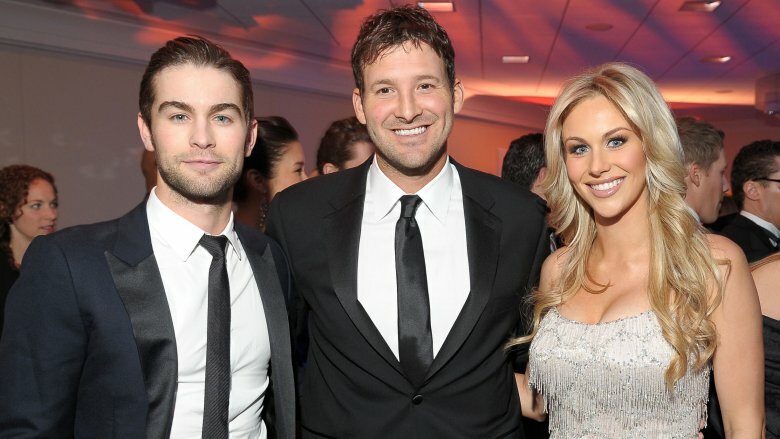 Rumor recap: Romo dated Underwood before she moved on with Chace, but she couldn't give the Gossip Girl star 100 percent because she was still hung up on Romo. Oy vey. After her relationship with the former athlete was officially kaput, Underwood was asked by Esquire if she wrote her tune "Cowboy Casanova" for Romo, since he was the first-string quarterback for the Dallas Cowboys at that time. "No. I would never immortalize a guy that did me wrong," the Grammy-winner said. "I would never give him that much credit." Oh, snap. Do you think these brothers-in-law rag on Underwood in private? We. Need. More. Details!